The plumbing can be divided into three separate sections: gray / black water, sea water and fresh water. Let’s start with the least pleasant, the gray/ black water. Gray water is what drains from the sinks and showers. Additionally, the port and starboard line troughs, which bring lines aft from the mast, drain respectively into the galley sink and aft head sink plumbing. The sink plumbing drains directly overboard through appropriate thru-hull valves while the showers are pumped through an anti-siphon loop and then overboard. Black water is what comes from the toilets. Each toilet has a black water holding tank and a three way valve. The forward black water tank is 26gal while the aft tank is 10gal. The three way valve can be set to route the toilet waste to either the holding tank, or directly overboard through an anti-siphon valve. The holding tanks can be emptied either by an onshore pump out station via the deck level fitting, or overboard via the onboard pumps. Sea water is available for a surprising number of uses. 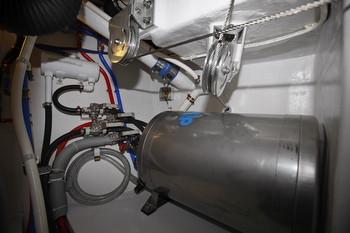 First there is a pump which supplies two deck mounted wash down hose fittings used for on deck clean up. Then sea water is used for cooling the Yanmar main engine and also for cooling the air conditioner mounted under the forward berth (see HVAC). Sea water is also used to flush the aft toilet and there is sea water available at the galley sink as a back up in the event of a limited supply of fresh water. And finally, there is sea water supplied to the water maker. The fresh water system starts with two storage tanks. Aft of the engine and under the cockpit sole is a 100gal tank and just forward of the mast and under the shower is a 45gal tank. A valve selects which tank supplies the fresh water plumbing. In practice we keep the forward tank as a reserve and use the aft tank as our “working” tank. The freshwater system is pressurized by a Jabsco Sensor Max VSD pump. I had great experience with this pump on my last boat so it was my first choice for New Morning. It’s a variable speed pump with a pressure sensor that only runs hard enough to keep the system pressurized, yet delivers 4.5gpm when needed. Of course at a marina we can fill the tanks with fresh water from a hose through the deck filler. At most marinas we first run the water through a charcoal filter and if the water is at all questionable then we also run it through a ceramic filter which removes virtually all bacteria and viruses. Our preferred source of water is the Spectra Newport 400 Mk II. It turns out of 15-16gph of very soft fresh water (no minerals remain after reverse osmosis). Over time we’ve learned to make water with clean sea water and avoid cloudier water if possible. The water maker works fine with the murkier water (which is frequently just sand or plankton) but it clogs the filters much faster which means more filter changes. Filters can last as little as 3-4 hours, or as much as 100-150hrs depending on the water. I turns out that the water maker flush cycle is pretty well in sync with our consumption and battery charge cycle. The water maker wants to flush itself with fresh water every five days, so ideally we make water again in less than five days rather than throw away three gallons of water. Our water consumption averages about 20 gallons / day, depending on how much we use the washing machine, and then our batteries usually need to be recharged after about five days as well. 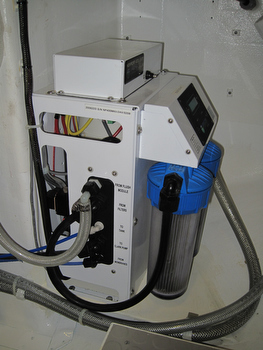 So ideally every 4-5 days we would charge the batteries (while underway), make water and wash clothes! It doesn’t usually sync up perfectly, but we do frequently make water and wash clothes while charging. We make hot water by three different methods. The most common is that our engine cooling water is routed through the hot water tank and makes very hot water. The second method is via our Espar diesel heater. There are times when we’re at anchor that we just want a hot shower, but we haven’t run the engine recently; the Espar heater does the job (see HVAC). And finally we can use shore power to heat water. In addition to normal domestic water use (dishes, showers, etc.) 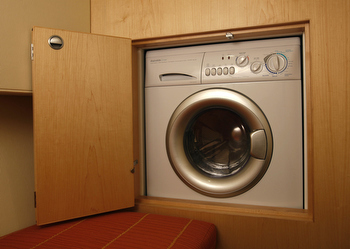 the toilet in the forward head is flushed with fresh water and the clothes washer uses 8-10 gallons per load. We also have a hand shower on the transom and a mid-ship fresh water hose fitting for on deck fresh water.